When it comes to depiction of price, candlestick charts and bar charts are similar, because they both feature the Open, High, Low and Close (OHLC) prices. However, candlestick charts are more popular than the bar charts because they present more information about the behavior of the market participants on both sides of the coin (i.e. buyers and sellers). So candlestick charts incorporate features of the bar charts, and still present unique information in the form of patterns, which can be tapped into to make money in trading. Specifically speaking, the opening and closing prices on candlesticks provide a lot more information than they do on bar charts. Bar charts are of Western origin, while candlesticks are of Eastern origin (Japan specifically). Candlesticks present a body and a shadow (the wick). The sizes and lengths of the shadows and bodies all tell a story. The body of the candlestick is the area which ranges between the open and closing prices. It is the wider area of the candle. The shadow looks like the wick of a real-life candle; it can form above and below the body, and the tips usually represent the high and low prices within the time period measured by the candle. A candle may have one shadow, two shadows, or none at all. The body of a candle could be black (bearish) or it could be white (bullish). Bodies can be long or short. A shadow can also be long or short. These all tell a story. When a shadow is long, it is a sign that prices cannot maintain their highs or lows. In other words, a particular set of market participants have driven prices far, only for the opposing traders to force them back. This could happen in buying or selling situations. When a body is black (or red as depicted on some charting programs), this means that the candle has closed at a lower price than it opened. When a body is white (or green), this means the closing price is higher than the opening price. When the candle’s body is long (whether white or black), it signifies that the move is strong. When the candle is short, the move is weak. A candle without bodies is a sign of indecision; a doji. In using candlestick patterns to provide information for trade purposes, attention is paid to the positioning of the body and shadow, the length of each, the colour of the candles, and where the candles have closed or opened, relative to defined areas of support and resistance. Candlesticks are best used in the context of a top or bottom, therefore there must be a preceding trend before a candlestick pattern occurs for it to be used validly. This chart above illustrates the point just stated. H1 and H2 are both hammers, which are pinbar reversal candlesticks. However, H1 is located in the middle of the trend and so is of no use to the trader. In contrast, H2 occurs at the bottom of the trend. How do we know that this is a bottom? This is because it formed at the same level as a previous bottom, and a line between these two forms a valid support line. 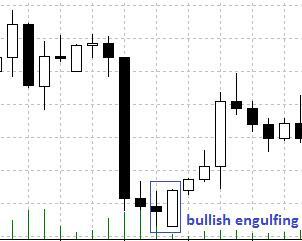 Furthermore, a candlestick pattern should not be used alone to make a trading decision. Other forms of confirmation must be added to the mix. The following candlesticks patterns are made up of one or two candlesticks only. 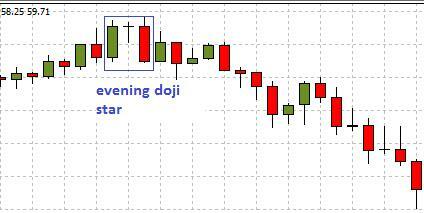 Also known as the indecision pattern, the doji is a single candlestick pattern formed when the opening and closing prices of a candlestick are the same. The real body is thus represented by a horizontal line, which intersects the vertical shadow to form a cross. It is a sign of indecision or equilibrium and shows that a reversal may be on the way if it occurs at the extremes of price action. They should not be used solely as signals of price reversal. The word “harami” in Japanese means pregnant. So we have in the harami pattern, a two-candlestick pattern where it seems the longer-bodied day 1 candle is bearing a pregnancy (the shorter bodied day 2 candle). Each of the two candles can be of either colour. 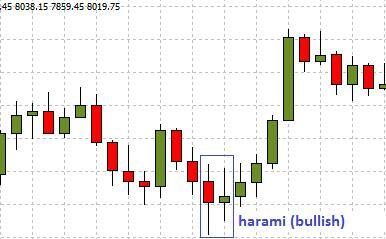 The harami pattern’s day 2 candle has an upper shadow which does have to be within the price range of the day 1 candle’s body. However, the real body of the day 2 candle must be within the range of price formed by the body of the 1st candle. The candles known as the “hammer” and the “hanging man” look alike, but have greater importance at bottoms and tops respectively. The real body of both candles is located at the upper 1/3rd of the trading range of the candles. The lower shadow is usually twice or thrice as long as the real body, leading to an upper shadow that is either very small or absent. The colour of the bodies could be black or white; it really makes no difference. As mentioned earlier, the candles of this form that occur at the top end of an uptrend is known as the hanging man, while that which forms at a bottom is the hammer. This is depicted in this snapshot below. The shooting star and the inverted hammer are the opposites of the hanging man and hammer. The only difference is that the real body is located at the lower one third of the candle, with lower shadows that are either non-existent or very small. The shooting star occurs at market tops, while inverted hammers are found at bottoms. Their upper shadows are usually twice as long as their real bodies. They could be of black or white colour. They do not perform as well as the hanging man and hammer, so have a lower reliability index. As the name implies, the engulfing pattern is formed by a smaller 1st candle and a larger 2nd candle whose body “engulfs” the body of the 1st candle. 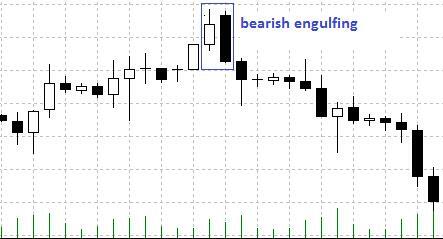 Engulfing here means that the body of the day 1 candle is smaller and is contained within the body of the day 2 candle. This is a powerful trend reversal pattern and must therefore occur at the end of a trend (i.e. at a top or bottom) to be useful to the trader. The colour of the candles is specific and significant. The day 1 candle has the colour of the pre-existing trend. The day 2 candle takes the opposite colour (i.e. the colour of the reversal trend). So a bearish engulfing candlestick pattern has a white day 1 candle with a small body, while the day 2 candle is a black candle with a longer body that engulfs the day 1 candle. A bullish engulfing candle has a black day 1 candle with a small body, and a longer-bodied day 2 candle which is white. The shadows are not used in the consideration of the lengths of each candle. A dark cloud cover is a two-candle pattern formed by a white, large day 1 candle and a black, large day 2 candle. The open price of the day 2 candle is above the upper shadow of the day 1 candle. The close of the day 2 candle is within the day 1 body range, but should be in the lower half of that range. This has significance at a market top. The piercing line pattern is the opposite pattern found at market bottoms. The formation is the reverse of the dark cloud cover: a black large day 1 candle and a large white day 2 candle which gaps below the lower shadow of the day 1 candle and which closes within the upper half of the range of the day 1 candle. 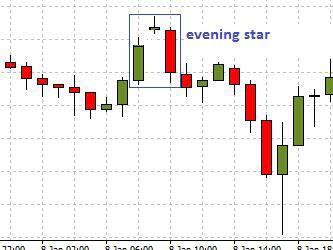 The three candle patterns known as the morning and evening star patterns are opposites of each other, occurring at market tops and bottoms respectively. In these patterns, the day 1 candle is the colour of the pre-existing trend. The 2nd candle resembles a doji, but actually has a small body that gaps above (evening) or below (morning) the day 1 candle. The star can be black or white in colour. The 3rd candle is the colour of the reversal trend. The most important point here is that the star does not cover any part of the day 1 candle’s shadow. This pattern is one of the best performing candlestick patterns. 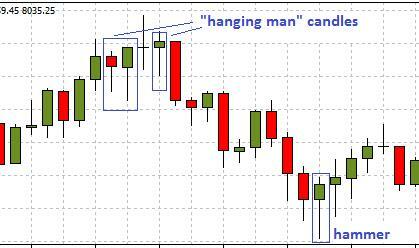 Many other candlestick patterns exist. Books by Steve Nison on candlestick patterns are available for those who want to get more insight into candlestick patterns and how they can be used.